In the last two tutorials, I showed you some simple ways of combining die cuts created with Cuttlebug ® ’s Vintage die set. I hope you’ve done a little experimenting of your own with this versatile set. 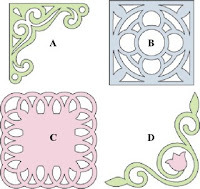 As promised, I am going to show you some of the combinations possible with the two die used to create the Filigree Medallion and the Mini Medallion. Only dies A and B will be used for the following configurations. By way of review, this is the scroll corner with alignment holes indicated. All of the configurations that use this piece are aligned at the holes. 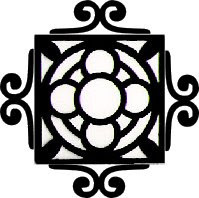 By combining two corners you can create this ornate square. It is shown here in two colors for clarity. By combining four corners you create the base of the filigree medallion demonstrated in my first CB tutorial. This is the “negative space” cutout from the scroll corner that I call double cane. This is a wonderfully versatile piece. Note: This is a rather small piece and creating some of the designs can be very tricky. I suggest using a bent nose tweezer for placement. Okay, I think you can see where this is going. The possibilities are limited only by your imagination. Now let's see what you've got. Show me YOUR Cuttlebug die cut creations. Click here to go to Part I of this tutorial series. I hope you liked my CB tutorials. Please leave a comment. I would greatly appreciate it. Thanks for stopping by. Thank you so much for all 3 of these tutorials. They are awesome and so are you for sharing!! These combinations are incredible!!! Thank you so much for sharing all of this. I loved all three parts of your tutorial and I must get this die set soon! Wow - you have given a whole new dimension to this die set - thank you for sharing your talents - will be checking your blog often. Gitana you are amazing :) I have this set of dies and this gives me many reasons and means to enjoy them, thanks so much for sharing your creativity. Wow! Very creative and gorgeous! Die set. You are a very talented lady.